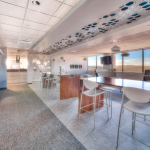 This occupied renovation project included the build-out of three floors containing private offices, open areas, meeting spaces and common spaces as well as renovations to ground floor public areas. The project also included a conference center on the lower level, main lobby and cafeteria renovations, and UPS/generator migrations. 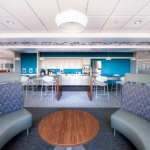 Howell utilized Procore project management software to closely collaborate with the out-of-state client and design team on this project. Howell provided services to support the consolidation and decommissioning of furniture systems and MEP systems on floors 4, 5 and 6. Howell was also awarded Jackson National’s occupied first and second floor remodel projects.